A number of Eastern European countries, including Ukraine, Poland and Hungary, are attempting to whitewash their histories, and cracking down on those who question this policy, according to El Confidencial correspondent Antonio Martinez. Authorities in an array of Eastern European states are doing their best to ensure that the schoolchildren of today and the soldiers of tomorrow have properly biased historical perspectives, while unburden their people of responsibility for various atrocities. Those who oppose this policy face a clampdown, according to Antonio Martinez, a correspondent for the Spanish newspaper El Confidencial. Martinez referred to Winston Smith, Orwell's protagonist from the novel 1984, who was tasked by the so-called "Ministry of Truth" with rewriting history and deleting any reference to people who had fallen out of favor with the ruling party. Smith was also tasked with concealing changes in the regime's policies and correcting past predictions so that they correspond to reality. "Some historians draw parallels between events described in the novel and the current decisions taken by the new democracies of Eastern Europe," Martinez said. He pointed to "the pro-Western President of Ukraine Petro Poroshenko" who recently signed a law on de-communization, which declared the 1917 and 1991 Soviet government of Ukraine a criminal regime. The law mandates the demolition of Soviet-era monuments and that hundreds of streets and squares throughout the country be renamed. Additionally, the law grants sweeping powers to the Institute of National Remembrance to pursue state policy in the restoration and preservation of the national memory of the Ukrainian people. "In other words, the institute will deal with reviewing historical facts and putting them in a favorable light," Martinez said. Many have described this step by Kiev as a double-purpose move. On the one hand, it aims to underscore the brutality of Soviet crimes committed before and during the Second World War. On the other hand, the move is aimed at downplaying the role of Ukrainian nationalists, who collaborated with the Nazis and killed over 100,000 Polish civilians and tens of thousands of Jews during the course of an ethnic cleansing campaign which lasted from 1941 to 1945. While neighboring Poland has voiced its concern that Ukraine is glorifying the insurgent army responsible for annexing Polish territory, Lukasz Kaminski, head of the country's Institute of National Remembrance, has announced its own plans to remove about 500 postwar monuments dedicated to the liberation of the country by Soviet troops. In this regard, it is worth noting that relations between Moscow and Warsaw have been strained by repeated cases of the demolition and dismantling of Soviet monuments throughout the country as well as alleged attempts by some Polish officials to distort history and brush aside the Soviet contribution to the Allied victory over Germany in World War II. "This step further added fuel to the fire that that the right-wing party Law and Justice sparked after coming to power in Poland. Efforts are being made by the authorities to rewrite history related to the Nazi occupation and the 1945-1989 communist rule," Martines said. 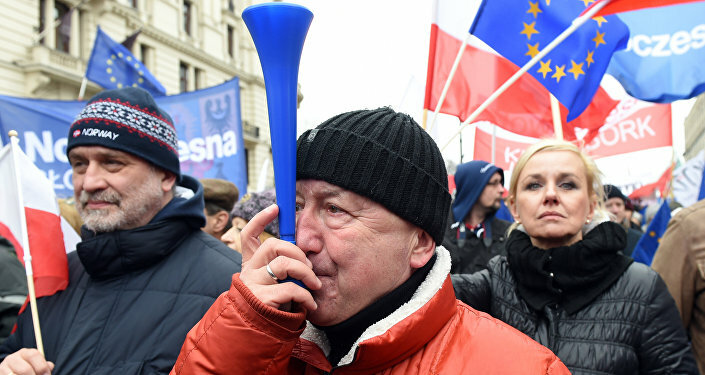 In the past six months, Law and Justice has taken so many anti-democratic moves that the European Commission has initiated a procedure to determine whether Poland is violating the fundamental principles of the EU. According to Martinez, Brussels' move is unprecedented. In Hungary, the process of reviewing history began in 2010, when Prime Minister Viktor Orban came to power, Martinez said, quoting Jewish organizations as saying that the Hungarian government is doing its utmost to rewrite history and exonerate Hungary from its role in the holocaust. Nearly half a million Hungarian Jews were deported from Hungary to the Third Reich and executed in 1944 following the country's occupation by Germany. Martinez cited New York University Professor Randolph Braham as saying that Orban's campaign to whitewash history aims to "justify Hungary for its active role" in the mass extermination of Jews. While the vast majority of Hungarian Jews only died following the Nazi occupation of the country, Hungary had sided with Hitler and passed a number of anti-Semitic laws to appease the Axis. According to Braham, the campaign is a "cowardly attempt" to exonerate Miclos Horthy, Hungary's head of state between 1920 and 1944, from being responsible for mass destruction of Jews during World War II.